We began as (and are incorporated as) Superior Martial Arts Federation. Formed in Superior Wisconsin moved to Menomonie in 1985. Mrs. Linda Young and her son Travis began their training in the spring of 1985. Mr. Stuart Skrove was the first member to earn his black belt in 1993 taking over the teaching duties in Menomonie. In December of 1996 Travis earned the Rank of Shodan-Ho and confirmed it in December 1997 and took over all instructional duties in May of 2001. In 2001 Linda and Travis attended a Seminar featuring the teaching of Charles Merriman Sensei and many of his students. We formally joined his organization at this time under the tutelage of Brian Loterbauer Sensei. Merriman Sensei traveled to Wisconsin in September 2002 for the first time. We have followed his teachings toward the Judokan in Okinawa to which we had the honor of traveling with Merriman Sensei multiple times to further our understanding of Okinawan Goju Ryu Karate. In 2003 we moved to our present location and became known as Menomonie Goju (Ryu). In 2012 after being part of Merriman Sensei’s organization for 11 years a decision was made to leave with Loterbuar Sensei and become a part of the Goju Ryu Kenkyu Kai. 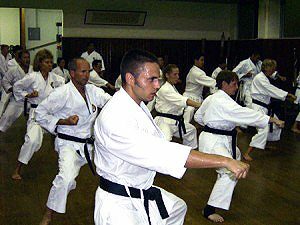 Both Linda and Travis continue to be active in the pursuit of Knowledge about Okinawan Goju Ryu history, traditions and techniques. Travis was awarded Shibu (dojo Holder status) in the Okinawan Goju Ryu Kenkyu Kai in 2015, and became affiliate instructor with the Matayoshi Kobudo Kodokan International in 2016. At the age of 14, Chojun Sensei began to train directly under the supervision of Naha Te founder Kanryo Higaonna Sensei. teaching role to include the Teacher’s College, Naha Commercial High School, and the Police Training Academy. In 1927, he held a Karate Seminar at the University of Kyoto and followed this up with seminars to spread Karate at Kansai University, Ritsumeikan University, and Hawaii. When one of his top students, Jinan Shinzato Sensei took part in the All Japan Budo Commemorative Demonstration, he was asked what style he practiced. Based on the hard and soft breathing in the style, he named the style Goju-ryu. Following the death of Chojun Sensei in 1953, many students have continued to spread and develop Goju-ryu throughout Japan and the rest of the world. Chojun Miyagi Sensei’s wishes were fulfilled when Ei’ichi Miyazato Sensei was chosen as his successor.